Ubisoft has today announced that it has a new Uno game in the works. Developed by one of Ubisoft's Chinese studio in Chengdu, this new Uno is in development for PlayStation 4, Xbox One, and PC, and it's the kind of card game that it worth keeping around on the hard drive for short matches in between longer gaming sessions. Related reading: Another must-have hard game on PlayStation 4 is Pure Hold 'em poker. Matt's full review. As you could expect, this version of Uno comes with online multiplayer and the classical game as standard. When you're playing online with friends you can also turn on voice and video chat for the really social experience. 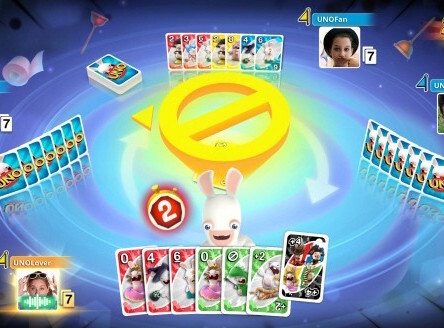 For players looking to very up the game a bit, there's also some house rules options, as well as an Ubisoft Rabbids-themed game that includes four new cards that have other impacts on the game than you remember from vanilla Uno. Ubisoft has rights to many of the classic board and card games at the moment, and has also released versions of Risk and Monopoly on the current generation of consoles. Uno is a far more simple game, but it's a modern classic because it does have that addictive accessibility that makes it easy to play for hours after hours. You won't need to wait for long for the game; it releases August 9.